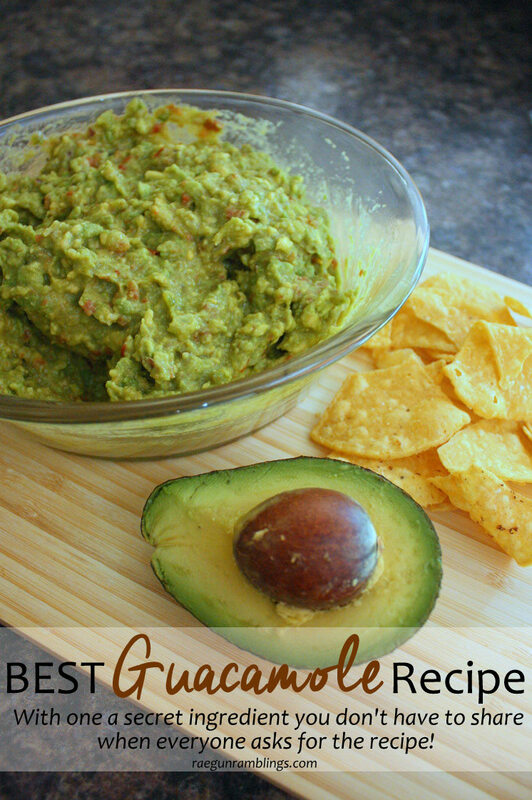 This my friends is hands down The BEST Guacamole recipe. 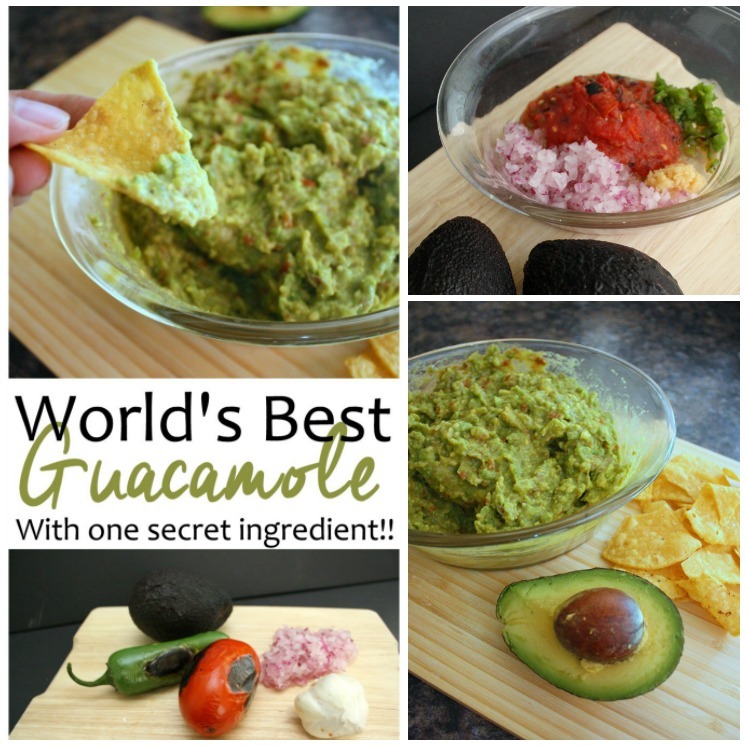 In fact it may even be the best guac you’ll ever eat even including fancy (or fantastically divvy) restaurants! Since before I was married my hubby has raved about Jana’s guacamole. He reported times where she’d make the boys a batch and he’d eat it all up. Every guac was compared to hers and nothing was good enough. Well a couple years ago when she was extremely pregnant he called her up and asked her to teach me the secrets of the guac. Yup he’s THAT guy ha! We went over with all the ingredients and now I can say with confidence that I too can make the best guacamole I have ever tasted. I’m not a chunky veggie girl but I love this. Now I will share the recipe with you. It sounds basic but it’s delicious. You do need to taste as you go to see if you want more of anything but here is the base recipe adjust it to your liking. Chop onion, tomatoes, jalapeno and garlic very fine. (you can do bigger pieces if you like it chunky). Set aside. Mash avocados and 1 tsp veganaise into whatever bowl you want to use. Add tomatoes, onions, garlic and 1/2 of the jalapeno to the avocado mixture. Mix it all up. Salt to taste. Add more of the jalapeno if you want more kick (after you taste it). Add more veganaise if you want it creamier. Some times I add hot sauce, cilantro, and some onion powder. But this is one of those things where I add the ingredients in increments and taste and adjust. Do roast the veggies it makes all the difference. Enjoy. 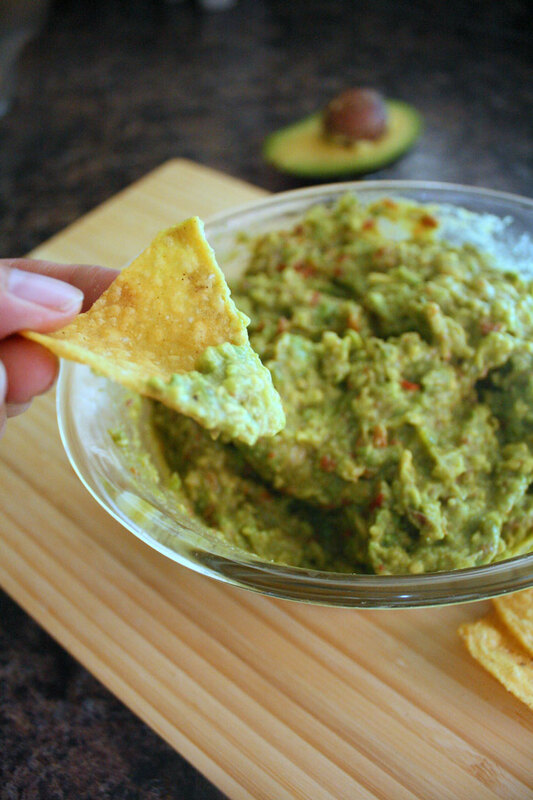 I know it looks like regular old guac but everywhere I’ve taken it people have gobbled it up fast, I think the roasting and creamy stuff make all the difference. 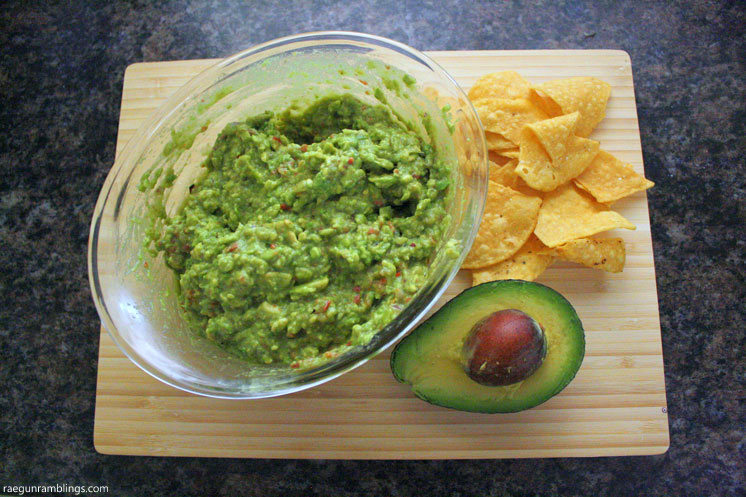 I originally shared this recipe 9/10/2008 but it’s soo good I thought all you newer readers needed to experience the joys of this guacamole recipe. Oh and of course improve on those hideous pictures! Want more great food tricks? 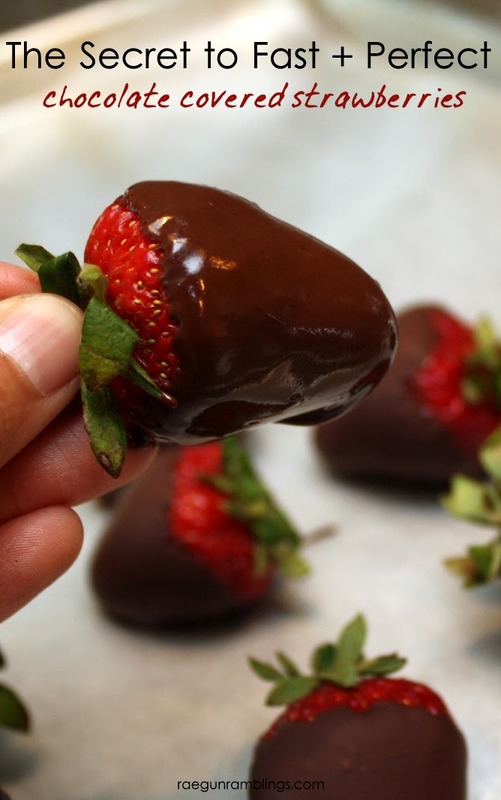 Everyone loves these chocolate covered strawberries and with this trick they are SO easy. 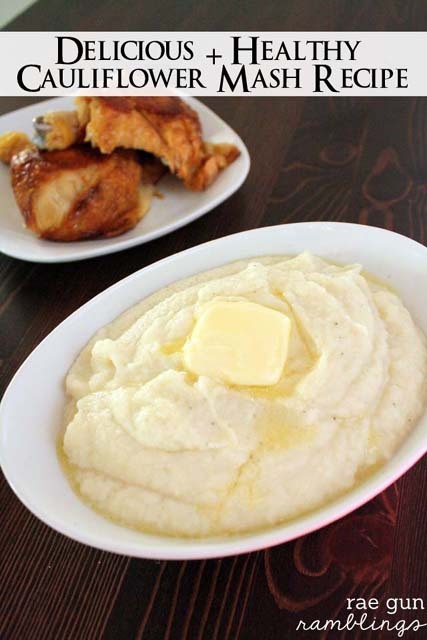 If you want some more veggies or just to save some calories this cauliflower mash is a great swap for traditional mashed potatoes! One of my go to weeknight favorites. 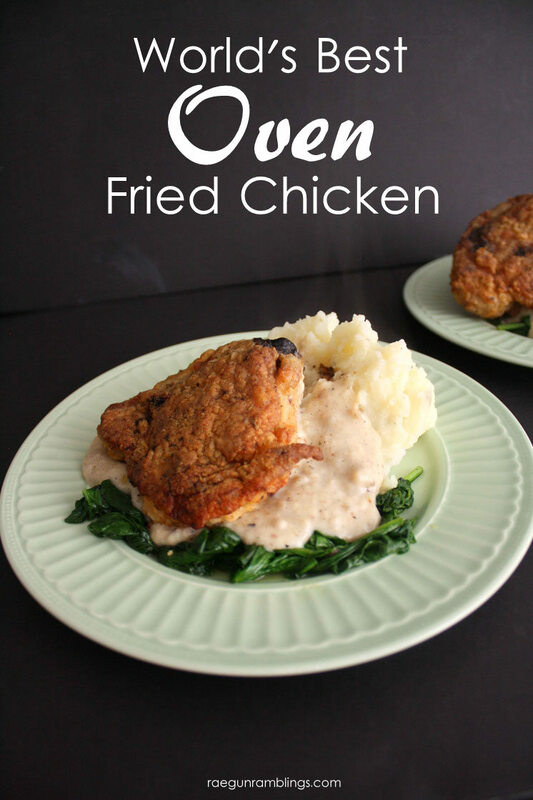 This Oven Fried Chicken recipe is SO good. 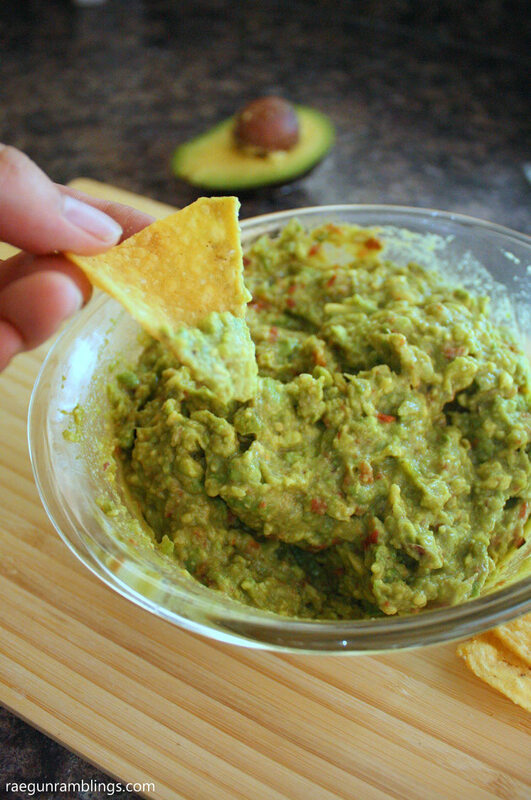 We are HUGE guac fans! Yummy! I have never made guacamole now I have no excuse. 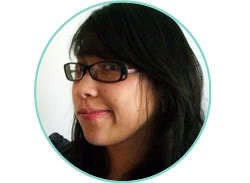 I would love for you to come share this on the new Share the Love blog party. Open thru Thursday. http://homecookingrecipebox.blogspot.com/ Than you for sharing this recipe. Do you include the roasted skin also, or only the inside ? I love guacamole but have never thought to roast the jalapenos and tomatoes. I bet that adds an entirely different flavor profile. I can’t wait to try this!! I haven’t heard of veganaise before. I don’t think we have it here in Australia. Can you tell me what it’s ingredients are and can something similar be made at home. If it is egg or dairy based, Australian quarantine services are very critical on it’s import. Guacamole doesn’t last long in this household and this sounds like a real winner- it’ll disappear faster.